Today has been a pretty good day. We started out rough. Allison had a rough night - with a fever of 103.6 (2nd night in a row). She is taking fluids ok....just not moving too much. I wouldn't be either. She took a 4hr nap on the couch this morning and woke up like a new kid. She has played on and off throughout the day. She even sat at the table for dinner. She didn't eat much. Just half of a crescent roll with her beloved butter on it. I have found that she loves Sprite and will drink it with no problems. That is what I have been giving her most of the day. She isn't quite sure how to take it. She asks and I jump. I am just happy to have her drinking. Right after coming out of surgery. Poor girl. 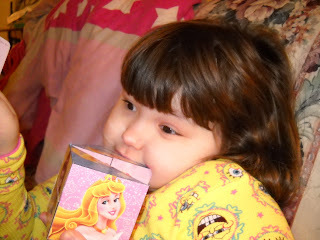 She had an ice pack to her neck and was "snuggling" her Get Better Buddy that her sisters got for her. 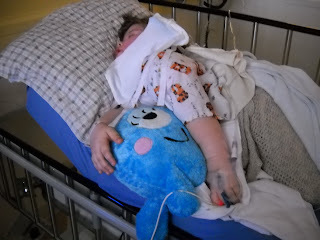 GBB and her blankie both accompanied her to the OR. Her first popsicle, in the recovery room. 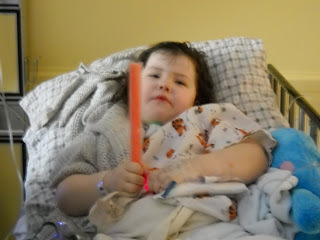 She ended up having 3 popsicles and 2 ice cream cups in the 3hrs that we were there after surgery. Very reassuring. Keep the prayers for a speedy recovery for our girl!!!! poor girly - i hope she is feeling 100% SOON. hang in there, mama. keeping you all in my thoughts. Poor little sweetie!! I'm sending lots of good thoughts!